Western blot analysis of extracts from A549 cells, untreated (-) or treated with hTNF-α #8902 (10 ng/mL, 6 hr; +), using CD54/ICAM-1 (E3Q9N) XP® Rabbit mAb (upper) or β-Actin (D6A8) Rabbit mAb #8457 (lower). 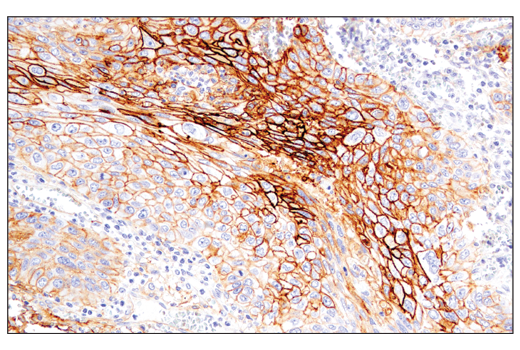 Immunohistochemical analysis of paraffin-embedded human urothelial carcinoma using CD54/ICAM-1 (E3Q9N) XP® Rabbit mAb performed on the Leica® BOND™ Rx. 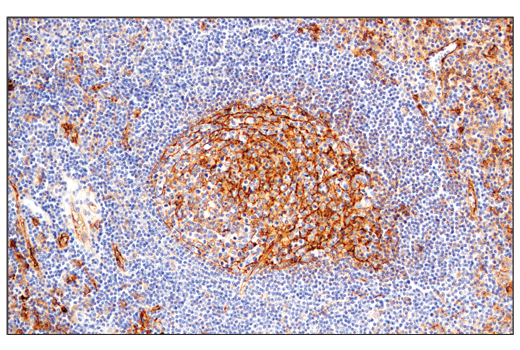 Immunohistochemical analysis of paraffin-embedded human squamous cell lung carcinoma using CD54/ICAM-1 (E3Q9N) XP® Rabbit mAb performed on the Leica® BOND™ Rx. 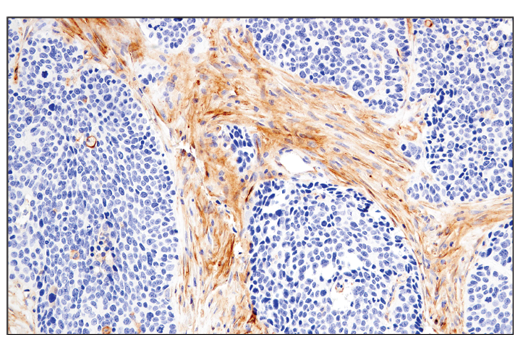 Immunohistochemical analysis of paraffin-embedded human prostate adenocarcinoma using CD54/ICAM-1 (E3Q9N) XP® Rabbit mAb performed on the Leica® BOND™ Rx. 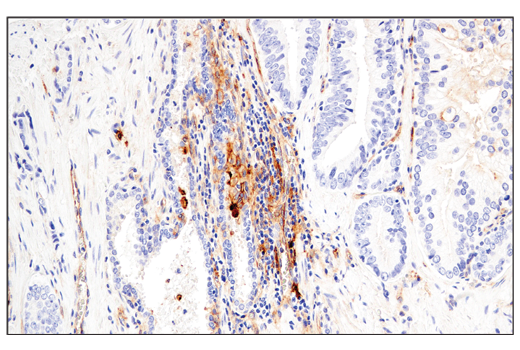 Immunohistochemical analysis of paraffin-embedded human colon carcinoma using CD54/ICAM-1 (E3Q9N) XP® Rabbit mAb. 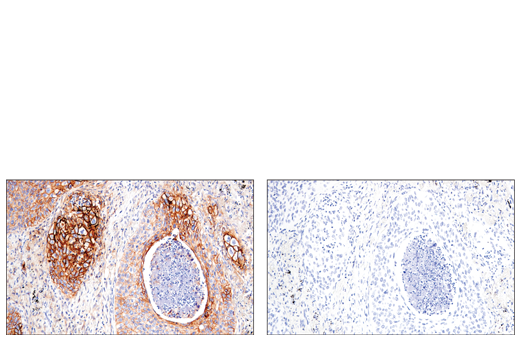 Immunohistochemical analysis of paraffin-embedded human squamous cell lung carcinoma using CD54/ICAM-1 (E3Q9N) XP® Rabbit mAb (left) compared to concentration matched Rabbit (DA1E) mAb IgG XP® Isotype Control #3900 (right). 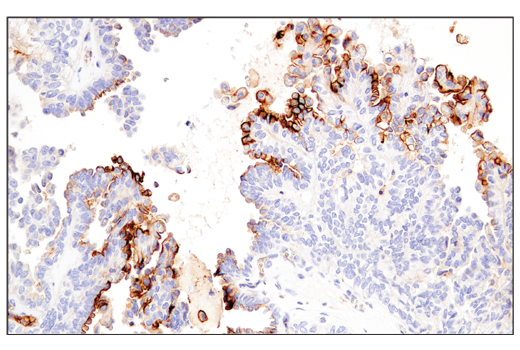 Immunohistochemical analysis of paraffin-embedded human tonsil using CD54/ICAM-1 (E3Q9N) XP® Rabbit mAb. 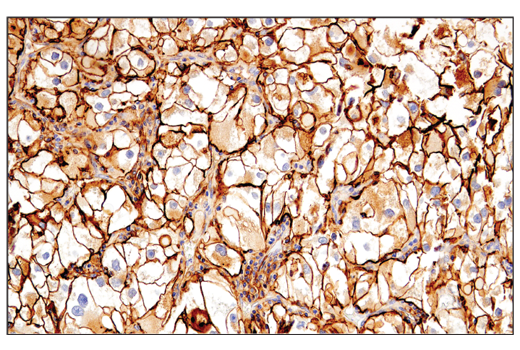 Immunohistochemical analysis of paraffin-embedded human renal cell carcinoma using CD54/ICAM-1 (E3Q9N) XP® Rabbit mAb. 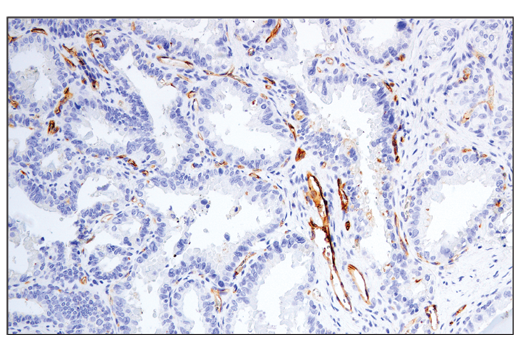 Immunohistochemical analysis of paraffin-embedded human endometrioid adenocarcinoma using CD54/ICAM-1 (E3Q9N) XP® Rabbit mAb. 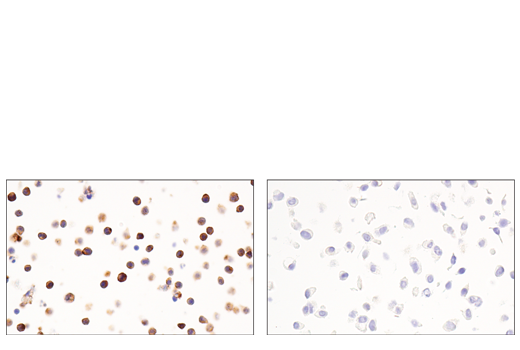 Immunohistochemical analysis of paraffin-embedded Ramos cell pellet (left, positive) or A549 cell pellet (right, negative) using CD54/ICAM-1 (E3Q9N) XP® Rabbit mAb. 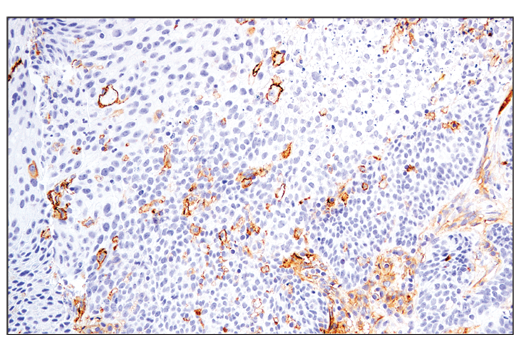 Immunohistochemical analysis of paraffin-embedded human prostate carcinoma using CD54/ICAM-1 (E3Q9N) XP® Rabbit mAb. 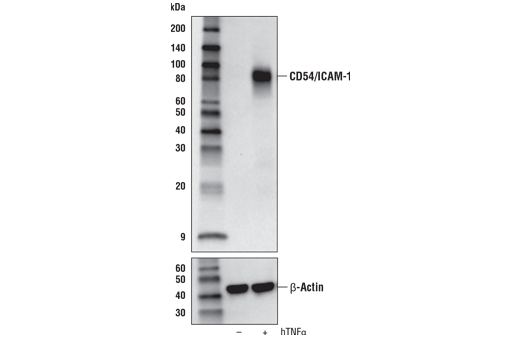 CD54/ICAM-1 (E3Q9N) XP® Rabbit mAb recognizes endogenous levels of total CD54/ICAM-1 protein. Monoclonal antibody is produced by immunizing animals with a synthetic peptide corresponding to residues surrounding Pro410 of human CD54/ICAM-1 protein. Intercellular cell adhesion molecule-1 (CD54 or ICAM-1) is a cell surface glycoprotein that belongs to the immunoglobulin superfamily (IgSF) of adhesion molecules. CD54 is expressed at low levels in diverse cell types, and is induced by cytokines (TNF-α, interleukin-1) and bacterial lipopolysaccharide (1). Apical localization of CD54 on endothelial cells (or basolateral localization on epithelial cells) is a prerequisite for leukocyte trafficking through the endothelial (or epithelial) barrier (1). Apical expression of CD54 on epithelial cells mediates pathogen invasion as well as host defense, a pattern also observed in tumors (1). CD54 also functions as a co-stimulator on antigen presenting cells, binding to its receptor LFA-1 (leukocyte function-associated antigen-1) on the surface of T cells during antigen presentation (2). Cross-linking of CD54 or binding to its ligand triggers activation of Src family kinases and the Rho/ROCK pathway (3-7). Phosphorylation on Tyr485 of CD54 is required for its association with SHP-2 (5). SHP-2 seems essential for CD54-induced Src activation (7). Hopkins, A.M. et al. (2004) Adv Drug Deliv Rev 56, 763-78. Nishibori, M. et al. (2003) J Pharmacol Sci 92, 7-12. Holland, J. and Owens, T. (1997) J Biol Chem 272, 9108-12. Etienne, S. et al. (1998) J Immunol 161, 5755-61. Pluskota, E. et al. (2000) J Biol Chem 275, 30029-36. Muro, S. et al. (2003) J Cell Sci 116, 1599-609. Wang, Q. et al. (2003) J Biol Chem 278, 47731-43.